Way back in September 2014, nearly a year before Terminator Genisys hit theaters, Paramount Pictures announced 2017 and 2018 release dates for the sequels Terminator Genisys 2 and Terminator Genisys 3. However, after Terminator Genisys underperformed at the box office, taking in only $89 million domestically, Paramount pulled Terminator Genisys 2 from its May 19, 2017 release date, and it seemed that the two sequels were not happening at all. 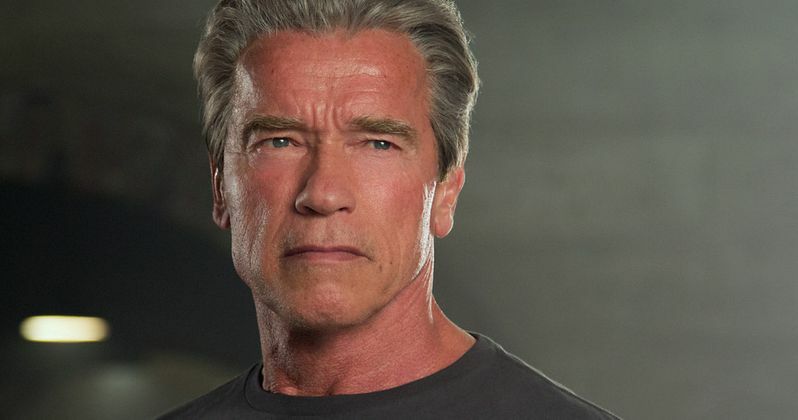 However, franchise star Arnold Schwarzenegger revealed in an interview with Australia's Channel 9 (via The Telegraph), that the movie is still happening. Take a look at his brief statement below. "I am looking forward to it, absolutely." Despite Terminator Genisys 2's release date being yanked, with the studio replacing it with their Baywatch remake, there is still hope that the sequels will move forward, eventually. The ERC Box Office Twitter feed revealed in January that the movie is now simply listed as "To Be Announced (TBA)." They went on to add that if the studio was truly pulling the plug on the entire trilogy, they would have said the sequel was completely pulled from the release calendar, so it's possible the studio still may move forward with these follow-ups. The studio didn't move the June 29, 2018 date for Terminator Genisys 3 either, so it's possible these sequels may still happen. While Terminator Genisys did underperform at the domestic box office, the movie did much better internationally, taking in $350.8 million for a worldwide take of $440.6 million, from a $155 million production budget. We reported back in October that that Terminator Genisys 2 was "indefinitely delayed," and just a few days later, Skydance's Dana Goldberg said the sequels weren't exactly "on hold," but that the studio was 're-adjusting' their plans. Even if Skydance and Paramount do plan to go into production on these sequels, the clock is ticking, because they will lose the rights in just under three years. The Terminator franchise rights will revert back to director James Cameron in 2019, 35 years after his 1984 classic The Terminator was released. This is likely why the studio set 2017 and 2018 release dates for Terminator Genisys 2 and Terminator Genisys 3. It isn't known if James Cameron has any plans to revisit the franchise after the rights revert back to him, but he'll certainly be busy in the meantime. The filmmaker starts production on his Avatar sequels later this year, with Avatar 2, Avatar 3 and Avatar 4 set for release in 2017, 2018 and 2019, respectively. Even if Terminator Genisys 2 is happening at some point in the near future, Paramount hasn't announced who will be writing or directing quite yet. Alan Taylor directed last summer's Terminator Genisys from a script by Patrick Lussier and Laeta Kalogridis, but it isn't known if they will come back for the sequel. Do you think Paramount should move forward with Terminator Genisys 2 and Terminator Genisys 3, even after the lackluster performance of Terminator Genisys? Let us know what you think below, and stay tuned for more updates.